In this tutorial we'll look at step 3, completing the pending SSL certificate request. 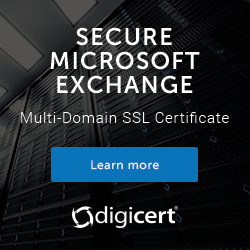 The certificate has already been downloaded and placed in a location that is accessible by the Exchange server's computer account, or by the Exchange Trusted Subsystem group. You will need to provide the UNC path to the file when completing the pending certificate request. I've placed my certificate in the C:Admin folder of my Exchange server. In the Exchange Admin Center navigate to servers, then certificates. Choose the Exchange server you need to complete the pending certificate request for, and selecting the pending request. Click the Complete link on the right side of the page. If the import is successful the certificate should now appear with a status of “Valid”. The next step is to assign or enable the certificate for Exchange services. Great article. Thanks for your assistance! I was having an “issue” where the EAC was telling me “The source data is corrupted or not properly Base64 encoded.” and I was looking though the comments of your 2013 article. You replied to a comment saying the EAC displays incorrect information sometimes. I wanted to leave this here in case someone has the same issue as it helped me solve my non issue. As usual yours is the best advice. How do I rekey a cert for Exchange 2016. I tried searching the web for specifics but could not find a thing. Is it as simple as creating a new cert and following the process. Is there a best practice we should follow when a cert request process goes pear-shaped and we need to re do it again? If you’re re-keying check with your certificate provider as they should have specific instructions for you.